Thank you for this opportunity to continue the conversation from last November’s hearing and the follow-up discussion in December on the disability programs we administer at the Social Security Administration (SSA). We share your commitment to effective oversight of Federal benefit programs, so that they remain strong for those who need them. Completed 429,000 full medical continuing disability reviews (CDR). Today, my testimony focuses on medical CDRs and age 18 redeterminations. We conduct medical CDRs and age 18 redeterminations to ensure that only those beneficiaries who remain disabled continue to receive monthly benefits. I begin with a very brief overview of our disability programs and the legislative history of CDRs and age 18 redeterminations. I’ll then discuss where we stand today in conducting these critical program integrity reviews, including our plans for processing them under the President’s FY 2015 Budget Request. Under the Social Security Act (Act), we administer two major programs that provide cash benefits to persons with disabling physical and mental disorders: the Social Security Disability Insurance (SSDI) program and the SSI program. The SSDI program provides benefits to disabled workers and their dependents. Workers become insured under the SSDI program based on contributions to the Social Security trust funds through taxes on their wages and self-employment income. Thus, SSDI benefits are commonly called “earned benefits.” Under the Act, most SSDI beneficiaries are eligible for Medicare after being entitled to cash benefits for 24 months. SSI is a Federal means-tested program funded by general tax revenues and designed to provide cash assistance to aged, blind, or disabled persons with little or no income or resources to meet their basic needs for food, clothing, and shelter. In addition to cash payments, most SSI beneficiaries are eligible for Medicaid health insurance coverage from the States. For adults under both the SSDI and SSI disability programs, the Act generally defines disability as the inability to engage in any substantial gainful activity1 due to a severe, medically determinable physical or mental impairment that has lasted or is expected to last for at least one year or to result in death.2 This is a very strict definition of disability when compared to definitions in many commercially available long-term disability policies. When Congress created the SSDI program under the “Social Security Amendments of 1956,”3 it included a mechanism for SSA to monitor a disability beneficiary’s continued eligibility by adding section 225 to the Act.4 This section authorized SSA to suspend the benefits and review the medical conditions of those beneficiaries believed by SSA to no longer have a disabling condition. Such reviews are generally conducted by examiners in the Federally-funded State Disability Determination Services (DDS), which also are responsible for making initial determinations of disability. By 1978, SSA’s monitoring activities had significantly dropped due to an increase in the size and complexity of its other workloads. The number of CDRs per 1,000 beneficiaries fell from approximately 111.8 in 1970 to a low of 29 in 1978.10 Consequently, there were fewer disability cessations. These circumstances raised congressional concerns that SSA was not properly monitoring the ongoing medical condition of its disability beneficiaries. Concerned about the erosion of public confidence in the disability program, Congress passed the “Social Security Disability Benefits Reform Act of 1984.”15 Section 2 of this law amended sections 223(f) and 1614(a) of the Act by establishing a Medical Improvement Review Standard (MIRS) for CDR cases.16 SSA issued final MIRS regulations on December 6, 1985. These regulations define “medical improvement” as any decrease in the medical severity of the beneficiary’s impairment(s), which was present at the time of the most recent favorable medical decision that he or she was disabled or continued to be disabled. In addition, the statute and SSA’s rules generally require that, even if the beneficiary’s condition has medically improved, the improvement must be related to his or her ability to work before benefits may be terminated. CDRs were resumed at a diminished pace in 1986. By the early 1990s, Congress was again taking notice of the CDR backlog and the difficulty the agency was having with balancing initial claims processing and program integrity reviews in an environment of increased workload pressures.17 In response to these concerns, Congress passed several laws aimed at increasing the number of CDRs SSA conducted. The “Contract with America Advancement Act of 1996” followed and included a provision authorizing the appropriation of special funds to be used exclusively to conduct additional CDRs over a seven-year period. 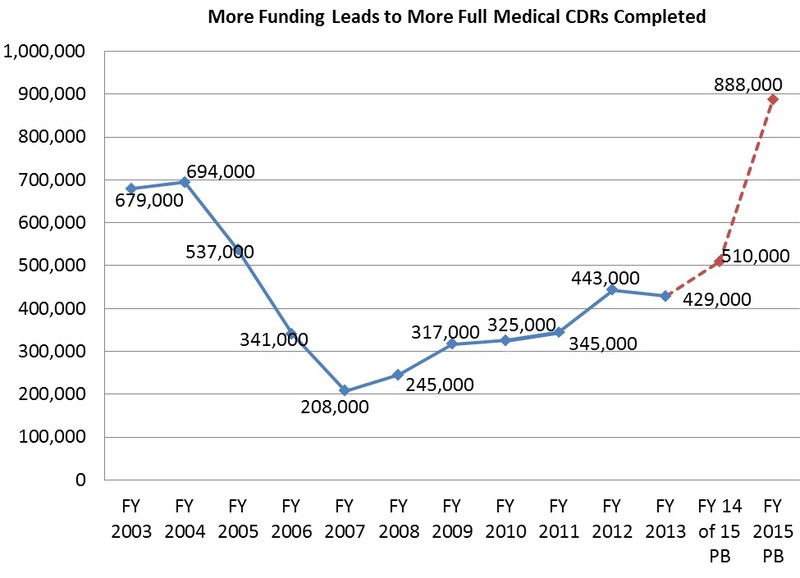 Most recently, the “Budget Control Act of 2011” (BCA) authorized additional funding over a 10-year period so that the agency could essentially eliminate the backlog of CDRs, as well as increase the volume of SSI non-medical redeterminations.24 As the chart (below) shows, the current backlog of CDRs developed due to lower volumes of CDR processing over most of the last decade, which occurred because of budgetary shortfalls. Regrettably, Congress did not fully fund the additional program integrity spending it authorized for appropriation during the first two years of the BCA’s 10-year period. For FY 2014, it did fully fund the additional resources it had authorized. As mentioned earlier, we periodically conduct medical CDRs to evaluate whether SSDI and SSI beneficiaries continue to meet the medical criteria for disability. We also conduct medical CDRs when we receive a report of medical improvement from a beneficiary or third party. The remaining beneficiaries who are due for review but have a lower likelihood of medical improvement receive a questionnaire requesting updates on their impairments, medical treatment, and work activities. If the completed mailer indicates that there has been potential medical improvement, we send the case to the DDS for a full medical review. Otherwise, we reschedule the case for a future review.26 Since 1996, we estimate that, on average, medical CDRs yield at least $10 in net Federal lifetime program savings per dollar spent, including savings accruing to Medicare and Medicaid. As history has shown, we produce results when we receive adequate funding for CDRs. For example, by the time the seven-year commitment of special funding we received in FY 1996 expired at the end of FY 2002, we had completed approximately 9.4 million CDRs (including 4.7 million full medical reviews) and were current on all CDRs that were due. For all the medical CDRs completed during the period of FYs 1996 through 2002, we spent roughly $3.4 billion, with an estimated associated lifetime savings from this activity of approximately $36 billion. Earlier, I touched upon Congress not appropriating the full program integrity amounts it authorized for us in the BCA in each of the first two years following enactment. For this reason, we were not able to increase our CDR levels during that period. This fiscal year, however, we will be able to expand our capacity to complete more of our cost-effective CDRs, because Congress appropriated the full BCA level. We plan to aggressively hire and train employees in FY 2014, allowing us to complete more CDRs and set the stage for handling even more in FY 2015. In FY 2015, the President’s Budget is once again requesting the full BCA level of program integrity funding for SSA, or $1.396 billion. With this funding, we plan to complete 888,000 full medical CDRs. For comparison, we completed 429,000 full medical CDRs in FY 2013, and we plan to complete 510,000 full medical CDRs in FY 2014. Starting in FY 2016, the budget proposes to repeal the discretionary cap adjustments enacted in the “Balanced Budget and Emergency Deficit Control Act of 1985,”29 as amended by the BCA, for SSA and instead provide a dedicated, dependable source of mandatory funding for SSA to conduct CDRs, as well as SSI non-medical redeterminations. The proposal includes the creation of a new account called Program Integrity Administrative Expenses, which will reflect mandatory funding for SSA’s program integrity activities. The mandatory funding will enable us to work down a backlog of 1.3 million medical CDRs. We need your support of the President’s FY 2015 Budget Request for our agency to continue ensuring that only those beneficiaries who remain disabled continue to receive benefits. As history has shown, the provision (or availability) of timely, sustained, and adequate resources is the single most important way to ensure that backlogs do not develop in program integrity reviews. We welcome continued collaboration with the Subcommittee to identify new opportunities that may further strengthen our program integrity review process. 1 Substantial gainful activity, or SGA, refers to the performance of significant physical or mental activities in work activity of a type generally performed for pay or profit. SGA is a test for determining initial eligibility for both the SSDI and SSI disability programs, as well as a test for determining continuing eligibility under SSDI. Generally, countable earnings averaging over $1,070 a month (in 2014) demonstrate the ability to perform SGA. For blind persons, countable earnings averaging over $1,800 a month (in 2014) demonstrate SGA for SSDI. These amounts, however, are subject to modifications and exceptions based on very complex statutory incentives designed to encourage work. 2 We also have an SSI disability program for children under age 18. To qualify for SSI benefits based on a disability, a child must have a physical or mental condition that results in marked and severe functional limitations. This condition must have lasted, or be expected to last, at least one year or result in death. 4 U.S. Senate. Committee on Finance. “Staff Data and Materials Related to the Social Security Disability Insurance Program.” (S. Prt. 97-16). Washington: Government Printing Office, 1982, at 48. 6 U.S. House. Committee on Ways and Means. “Report on H.R. 6675.” (H. Rpt. 89-213). Washington: Government Printing Office, 1965, at 89. 7 U.S. House. Committee on Ways and Means. “Report to Accompany H.R. 3755.” (H. Rpt. 98-618). Washington: Government Printing Office, 1984, at 9. 8 U.S. House. Committee on Ways and Means. “Status of the Disability Insurance Program.” (H. Prt. 97-3). Washington: Government Printing Office, 1981, at 10-11. 10 U.S. Senate. Committee on Finance. “Staff Data and Materials Related to the Social Security Disability Insurance Program.” (S. Prt. 97-16). Washington: Government Printing Office, 1982, at 49. 11 P.L. 96-265, section 311. 12 “Timeline History of Continuing Disability Reviews,” SSA/Office of Disability and Income Security Programs Archival Document, circa 1995. 13 For example, see Engel, Margaret. “Eligible Recipients Losing Out; U.S. Gets Tough With Disabled.” The Washington Post 7 Sept. 1982: A1. Print. 14 U.S. General Accounting Office. “Social Security Disability: Implementation of the Medical Improvement Review Standard.” December 1986, at 8. 15 U.S. House. Committee on Ways and Means. “Report to Accompany H.R. 3755.” (H. Rpt. 98-618). Washington: Government Printing Office, 1984, at 2. 16 P.L. 98-460, section 2. 17 For example, see the written statement of Jane L. Ross, Associate Director, Income Security Issues, Human Resources Division, General Accounting Office, submitted to the House Committee on Ways and Means Subcommittee on Social Security, March 25, 1993. 18 P.L. 103-296, section 208. 19 P.L. 103-296, section 207. 20 P.L. 104-121, section 103. 21 P.L. 104-193, section 212. 22 P.L. 105-33, section 5522. 23 P.L. 106-170, section 101. In addition, under section 111, it prohibited scheduling a CDR based on work activity for disability beneficiaries who received at least 24 months of benefits, or using the work activity of those beneficiaries as evidence that the individual is no longer disabled. These individuals would still be subject to a regularly scheduled CDR that is not triggered by work and termination of benefits if the individuals’ earnings exceeded the SGA level. 24 P.L. 112-25, section 101. 25 Once we determine which CDRs are eligible for full medical reviews, we prioritize statutorily mandated reviews for release, which include age 18 redeterminations and low birth-weight baby cases. 26 Each year, we validate the mailer process by performing full medical reviews of cases in which we otherwise would have used the mailer process to ensure that the mailer process is properly identifying individuals who continue to be disabled. These cases and the hundreds of thousands of other similar cases we reviewed in prior years confirm that the mailer process is a sound, efficient way to conduct CDRs for most individuals. 27 The percent is based upon a statistically valid sample of case reviews. It reflects the percent of cases reviewed where we agree with the decision made by the DDS. 28 Details can be found in the “Annual Report on Social Security Pre-effectuation Reviews of Favorable State Disability Determinations” at http://ssa.gov/legislation/PER%20fy11.pdf. 30 Office of Management and Budget. “Analytical Perspectives, Budget of the United States Government, Fiscal Year 2015.” Washington: Government Printing Office, 2014, at 119.